Last night, I had Taiwanese food for dinner with a few friends. I ordered the spicy beef tendon noodle soup (and so did my friends). Hong shao niu rou jing mian – beef shank, beef tendon, bok choy, and noodles. We also had some finely chopped suan cai (pickled Chinese cabbage) to go with our noodle soup. In Taiwan, the soup base for this dish comes in two main varieties—clear or soy sauce-based. For either version, most stores use select boneless ribs and tendons for their tenderness and chewiness. As for the noodles, one may choose the wide or thin type; both absorb the broth and yield a robust flavor and a chewy texture in every bite. In the early days, cows were considered valuable production tools as they were mainly used to plow fields. Because farmers had a close relationship with these animals, the early residents of Taiwan did not consume beef. This gradually changed after 1949 when large numbers of mainland Chinese soldiers and their families relocated with the Republic of China government to Taiwan. 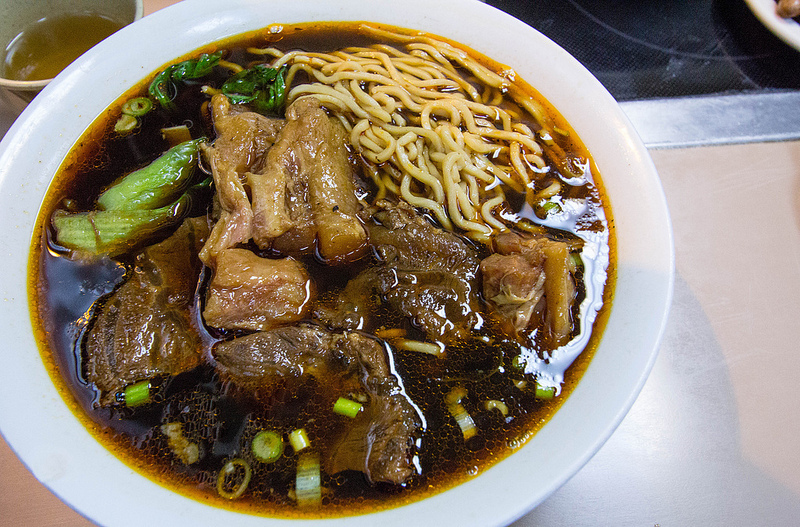 According to accounts, Taiwan’s own “Sichuan-flavored” beef noodle soup was first cooked up by a military family living in Kaohsiung’s Gangshan area. Nostalgic for the tastes of their hometown cooking, they used Gangshan’s famous spicy bean paste to make a small bowl of soy sauce-braised beef and served it with noodles. Although the dish was inspired by Sichuan flavors, it is not commonly seen in that province. In addition to the consommé and soy sauce flavors, new variations are constantly being created in Taiwan. The noodles are now also served in curry, tea infusion, Shanxi tomato broth, hot chili, or gravy, and are also made with the “three treasures” (beef, tendon and tripe).